We train in traditional Okinawan Martial Arts, including self-defense, traditional punches, kicks, and blocks, jujitsu, pressure points, and kobudo. We also incorporate respect for oneself, respect for others, and self-discipline into our training. Robert Trias, who first brought karate to the US, developed a karate system based on several different styles. As he refined his system, it became known as Shorei Ryu Karate. This system continued to grow and mature through the 50's and 60's. As karate grew in the US, many other styles appeared that shared the name Shorei became prominent, creating confusion as to what style was part of the Trias lineage. Eventually, in the 70's, Master Trias decided to rename his style to Shuri Ryu. He took the opportunity to also tweak his system. By this time, there were numerous students of his scattered around the country teaching Shorei Ryu, as well as many studying at his dojo in Pheonix. The students in Pheonix changed their style name to Shuri-Ryu, while many of the students around the country opted to stay with the Shorei name to describe their style. The result of this is that both styles still exist today, with the same roots, and are very much similar. The main differences are that the Shorei style had a larger variety of kata that the student could learn, and Shuri Ryu has separated the kubodu into a seprate system. They are both what we call Trias-te, and both are very effective. Classes are available to children as young as 6, through adults. We are priced affordably, at $25/month for children and adults, and offer 50% discounts for additional family members. We offer a range of classes, from family classes to separate child and adult classes, as well as separate skill level classes (under 6, basic, intermediate, advance). We do not have contracts, membership is on a month to month basis. Classes are taught by a black belt Sensei, with adult brown/black belt students as assistants and occasional substitute teachers. You or your child will never be trained by a child or teenager, or by a student under brown belt level. Sensei Schlosser spent several years as a fisherman. However, because he couldn't catch anything bigger than a minnow it led him to settle down as an engineer. In the course of his engineering career, he has obtained over 25 US Patents. He started his martial arts career at 13 years old, learning Tae Kwon Do on and off. At the age of 34 he returned full time under Jay Thompson and Mike Belot, who studied under Robert Bowles. He earned his first black belt at the age of 37 and continued to learn the martial arts, reaching the rank of 3rd dan in Shuri Ryu before the dojo closed. 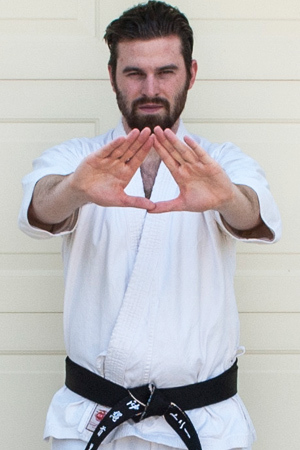 Sensei Schlosser began teaching at the local YMCA, eventually opening up his own dojo. 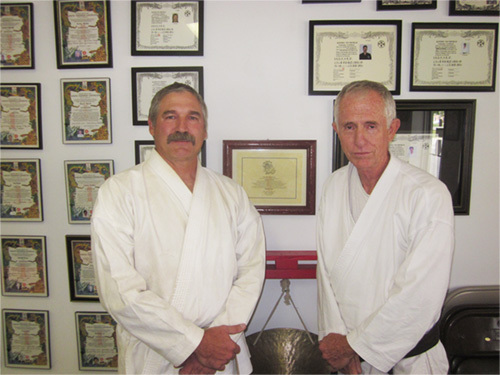 Continuing to search for Karate knowledge, he encountered Master Terry Sanders, who was one of Robert Trias early students, and the head of Shorei Ryu. Sensei Sanders took Sensei Schlosser under his tutelage, and has helped him to continue to grow and further understand karate. 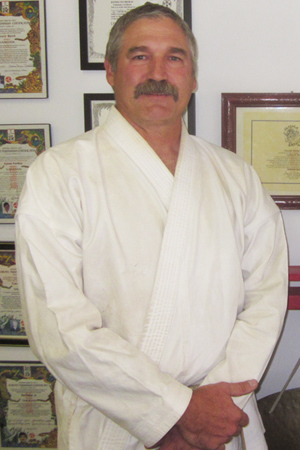 Under Sensei Sanders, Sensei Schlosser is currently a 7th dan in Shorei Ryu Karate. 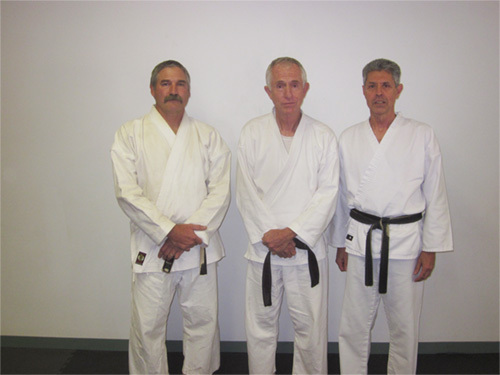 Sensei Waldron started Shuri Ryu karate around 40 years ago, but life got in the way. He ended up turning to the dark side, reaching the rank of 9th dan in Tang Soo Do before returning to the fold. He has since earned a 2nd degree black belt in Shuri Ryu. He's been a constant presence in the local tournament circuit. 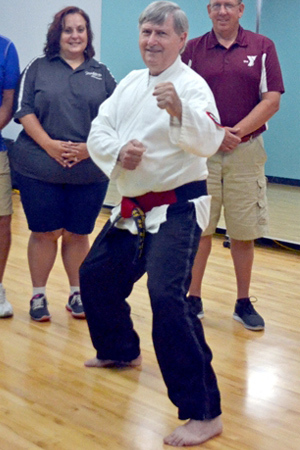 Bob is currently heading the Huntington, Indiana YMCA martial arts program, as well as continuing his participation as a student and instructor at our dojo. Sensei Petras not only has watched MMA fights, but he invented the octogan. He was always good at math and this passion caused him to pursue the field of accounting and become a CPA. He's considering running the Oscars next year to insure there are no incidents like this year. In fact, he has at times done balance sheets in Japanese. His bosses thought they were okay, as far as they could tell... His passion for the martial arts knows no limits. He has been training for over 13 years and is currently a 2nd degree black belt in Shuri Ryu. We are located 3 miles West of the Whitley/Allen Co. Line right outside Fort Wayne. For more information about Okinawan Shuri Ryu check out the Shuri Ryu Wikipedia page. We teach this traditional karate style. Shorei-ryu karate, a similar style taught by Terry Sanders, who was trained by Grandmaster Trias. For belts and high quality martial arts uniforms, shop the web's best martial arts retailer, Century Martial Arts. Please contact us to schedule a tour and watch one of the classes in session.